T.R.U. accepts reports of sightings through a variety of media inclusing online form entry, email, and Facebook message. Where possible, and subject to the wishes of the person making the report, a T.R.U. member will discuss the sighting with the person or people involved. As a starting point we assume that people making reports do so with honest intent. 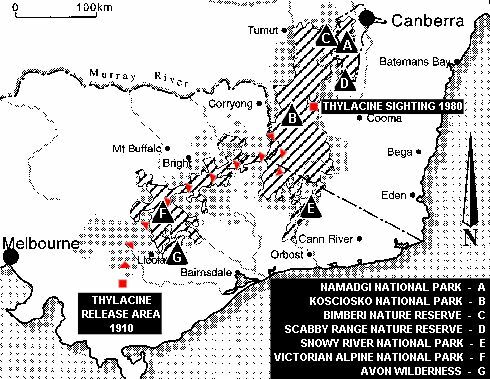 We first rank the sighting according to the academically-recognised Smith thylacine reporting classification system (The Tasmanian Tiger - 1980. National Parks & Wildlife Service, 1981, Steven J. Smith., 126-128). This includes factos such as visbility, lighting conditions, duration of the sighting and number of observers. Any subsequent investigations and critical analysis are based on the ranking system. A low ranking does not reflect at all on the person reporting the sighting; rather, it indicates incomplete observation, description or recall. For this reason it is very important to provide contact details so an experienced investigator can contact you if necessary to discuss the sighting. Your details will not be used for any purpose other than obtaining further details of the sighting, and will not be passed to any other party. Reports will be published on this website and may be anonymous if you so wish. Date of sighting? (dd/mm/yyyy) : November 2008. What was the time of the sighting? eg 4:00pm : Approx. 5:45pm. How many people made the sighting? : 1 person (went solo) plus 1 Long-haired Chihuahua Dog. How big was the animal (e.g. cat, small dog, large dog, sheep, fox sized) : Considerably, larger than a Fox and smaller than a Wolf. A medium sized dog. It didn¿t strike me as being particularly, large. Estimated height from ground to shoulder : Approx. 60cm. Length of body : Approx. 140cm (including head and body). Length including tail : Approx. 2 metres (including head, body and tail). Coat Colour : Mainly a dirty, golden fawn shade. I could also see charcoal-coloured strands scattered sparsely across the fawn coat. Distinguishing features of coat (colour, length, marks) : Medium hues of charcoal-coloured stripe markings could be seen from near base of tail, and markings continued along about two-thirds of the creature¿s back. The stripes were moderately bold in colour and did not appear to be full rings. The fur was short and dense. No mange could be seen. Leg length compared with body length : Approx. one third. Tail length compared to body length : Over half to two-thirds of body length (including head). Tail height (short, long, absent) : Long tail. Approx. 60cm to 70cm long. Tail shape : Strong-looking, long and straight cat-like or kangaroo-like tail. The tail length was strikingly long compared to a regular dog¿s tail. Short and dense hair. The end of the tail would occasionally curve/curl slightly, which I found rather peculiar. Shape of face and jaws : Dog-like, medium sized head. Not a particularly, large or robust head. Temples were wider than the muzzle. Muzzle/snout was quite elongated and tapered towards the nose. Strong looking neck. Ear length and jaws : Ears are similar to a German Shepherd Dog, but not as pointy. Jawline appeared to be similar in shape to a German Shepherd. Teeth were not able to be seen. Eye shape and colour : Eye sockets appeared triangular in shape with large and open eyes. The eyes appeared dark in colour, but I could not identify the specific eye colour because I was approx. 20 metres away from the creature and it was difficult to see. They appeared to gleam. Describe gait/movement : Similar to a dog and with an odd limping movement. Was wandering/sniffing a sign post like a dog. When the creature ran away, its movement was similar to a running Fox and/or galloping Horse, but not as fast. Describe any sounds or calls the animal made : Did not hear the creature make a sound. Please describe in as much detail as possible the narrative or details of your sighting : On this particular day, I decided that I would walk/jog around the southern side of the (location provided) in the late afternoon/evening. I ran up some rock steps and suddenly froze when I reached the top because I immediately spotted a strange looking dog-like animal, which looked rather like a Tasmanian Tiger sniffing a sign post some distance ahead of me. What struck me most about its appearance were the unusual stripe markings on its lower back and a long, cat-like tail. I gazed at the peculiar creature from a distance in disbelief, and then decided to quietly sneak up to it as close as I could, trying my best to avoid making a noise. I managed to get fairly close (approximately, 20 metres), as the animal seemed to be oblivious to my approaching it. I further observed the creature closely and noticed its strange limping movements and occasionally, the end of its tail would slightly curl up. It was a creature which I never saw before and my intuition was telling me it may likely be a ¿Tasmanian Tiger¿, as it clearly did not appear to be a Dog, Cat, Fox, Dingo or any other animal which I was familiar with. My heart stopped beating for a second, and I was completely awe-struck because I felt lucky to be one of the few who have come across such a magnificent and rare sight. I am adamant, that the creature was irrefutably, a Tasmanian Tiger. I was not afraid of the animal because I was aware from previous observations, that most animals of the Australian habitat usually choose to run away rather than be confronted by humans. As, I continued to proceed towards the creature, at some point I inevitably trod on a piece of gravel, which made a big crunching sound. The Thylacine quickly looked in my direction with its dark gleaming eyes and suddenly bolted across the Park, never to be seen by me again. As accurately as you can using gps or road numbers etc. can you describe the location of the sighting? : South Australian provided. Date and time of sighting : April 6, 2015 at approx. 8:15p.m. After a late-afternoon hike I was driving west towards home, my wife and daughter in the car with me, and had slowed down to about 85 - 90km/h due to the presence of many different animals. We had just been alarmed by a low-flying grey bat of some description flying just above our windscreen, and seen a spotted quoll running over the road, and also had to brake quite hard to avoid a possum which was standing up on it's rear in the middle of the road. I was on "high-alert" for more animals, and as we rounded a sweeping right-hand bend, I saw a quite large animal 'slinking' away from us over the top of a concrete culvert on the left (south) side of the road, about 80 metres in front of us. I was immediately struck by its appearance and movement, which seemed bizarre. As we got closer and then passed the spot, I said something like "Holy sh!t, did you see that?" Unfortunately, the response was negative. Even though we were in a bit of a hurry to get to our lodgings in Launceston for the night, I immediately decided to turn around to see if I could catch another glimpse, but when we got back to the site within a minute there was nothing to be seen. Parts of the animal were obscured by some vegetation, so I did not clearly see the head, and I also can¿t say with certainty that I saw its tail, but I saw clearly in the beam of my headlights for all of about 2 or 3 seconds its front legs, torso and hind legs. The animal was grey in colour, about the size of a medium/large dog, no visible stripes or other colouration, just a flat, plain grey colour all over, and the visible texture made me think the coat was quite thick and coarse. The front legs were thick and appeared too short in contrast to its hind legs, and the curve of the back was not smooth, almost like there was something wrong with its spine, like a kink in the curve just above where the front of the hind legs met the belly. The thing that I noticed most and remember so vividly is the way it moved, almost the way you see a kangaroo when it's walking along on all fours, sort of loping, but casually rapidly, and it was definitely not a kangaroo. Unfortunately, I cannot say with absolute certainty that I saw a thylacine (I wish I could), but I know what I *did not* see. It was neither a dog, a kangaroo/wallaby, nor a very large quoll or anything similar. Tail height (short, long, absent) : Didn't get a great look. We where behind it most of the time. Narrative : Was driving home with my son. A fast moving object running on all fours came out of a driveway and started running up the road in the direction we were heading. Because of the distance away I thought it was a really large Hare just because of the speed and the way it was running (not really dog like). Sped up and got closer and then realised it too big for a Hare so must be a dog. As I got closer it then ran up another access road through very thick scrub. I thought screw this what is it so I quickly followed it into the access road and sped right up to catch it. It actually then accelerated away from me and both my son and I could not believe it. It then turned left at top speed and disappeared into really thick dense scrub without breaking stride. As it turned left we got a side on view. It was a light fawn colour and had dirty light grey stripes/ saddle on it's back. Not bold black stripes like some pictures show of tigers. It was the size of a large whippet but had the running style of like a dog/cat cross. I am a dog person breeder/owner/trainer and if it wasn't a Tas Tiger my only other logical assumption would be some kind of feral whippet because it was in absolute fear of being seen. How did the sighting end? eg animal ran away : Animal ran full pace into dense scrub. What was the weather like at the time of the sighting? : Clear. Just had record snow and snow still in area. Where any footprints, scats, faeces, hair samples or evidence left behind after the sighting? : Didn't check. Bit freaked out. Narrative : This was years back. I pulled out of the Mundrabilla Roadhouse heading East. Only several minutes from getting back on the road, I saw what I have no doubt was a Thylacine. At the time I didn't know what it what. My initial impression was it looked like a prehistoric creature. It had a head much larger than most dogs, even pitbull. There were very distinctive stripes on it's back end and it had a very thick tail. I just watched a documentary on the Tasmanian Tiger and it reminded me of what I saw. Even though it was so long ago, seeing something like this leaves a very clear memory. There are a lot of feral dogs living out in the Nullabor. They seem scavenge around the roadhouse. I lived here by myself with my dog at the time. This is a very remote location. The nearest town is a good 45 minute drive. The property borders some very large nature reserves. I used to explore the area quite a lot. My property had over 1,500 acres of pine plantation. Several times I went walking through the pine plantations. The area has a lot of sheep. I found it odd that there were a lot a sheep bones in the plantations. Many with crushed bones. On several occasions at night my dog would bark at something that seemed to encroach on the house. The dog would always be up for running off and chasing creatures, if prompted. However, on these occasions the dog was barking in a protective manor, yet it would not pursue what it was barking at , when prompted... It was clearly scared! I have always heard of vicious attacks on sheep further west of this location, in the Margaret River area. I honestly feel that there is high likeliness Thylacine reside in this area. There is minimal human activity in the area. Vast nature reservations that are virtually untouched. Lake systems with water and farms with thousands of sheep. I was driving my kids to the surf west of Anglesea on Victoria's Great Ocean Road by about 5klm. Traveling at around 70 klm per hour an animal ran in front of my car - about 25 meters ahead of me. I was so shocked I immediately pulled over to the side of the rode, looked at my daughter next to me and we were both wide eyed and I said to her "what was that!" We were both stunned. Our instincts were to start saying what the characteristics were and we were at the same time eliminating animals - It wasn't a dog, it wasn't a cat etc.... It had a large head, It was bigger than a dog, it ran in a funny way, it had a big long strong tail.....my daughter commented that it was stripy around the girth --- which I didn't comment on but I'm colour blind. It was the most stunning thing I have ever sighted because I was so in shock --- my mind was working overtime trying to categorize what I had seen - I distinctly remember my mind zooming in on features of the animal in that say 5 seconds of detailed looking at it and storing features -- the main ones to me being bigger head, lean body, strange gait for that sort of animal and particuarly the strong tail. I said to my daughter after discussing the way it ran that it was running like a horse. Later we googled Tasmanian Tiger and I am still 100% convinced that is what I saw because the diagrams and the distinctive features all matched - especially the tail, gait, head, size --- along with my daughter referring to striping. Driving south down Brand Highway we saw a marsupial sitting upright, it looked too big to be a quokka and too small for a kangaroo/wallaby. It went forward on all fours and suddenly looked somewhat dog-like, with a tapering kangaroo-like tail. It ran across the road in front of us with a gait resembling a stiff, slightly awkward canter. There was either no striping or faint striping, it was a nondescript light brownish colour with a yellowish aspect around the flanks. The shape looked very Thylacine like. We stopped at Gingin for coffee and asked if people ever reported seeing Thylacines around there. The waitress was very unsurprised and said that her husband was interested in thylacines but she had no knowledge of any sightings in the area where we saw this creature. Please described the incident as best as you can : I live on a 150 acre property surrounded by state forest I was walking down to the river to check my Cray pots and the animal walked across the track in front of me. I thought it was a wild dog but the stripes on its back and the way it walked made me think it was a thylacine. I was walking through selectively cleared area at the rear of the property which backs on to wood forests of eucalypt which meets onto Dularcha National Park= . I had been at my garden which is on the ridge and had gone down through a track id cleared down the hill. As i was coming back up and about to leave that area I thought a goanna was coming through the bush of consistently sarsaparilla vine, so got a bit out of the way so it wouldn't run right into me. As I watched it from side angle i saw its head appear and thought, oh its a wallaby, but as it emerged I saw it was on four legs so thought it was a wild dog, but as it went away into the next thick bush, I noticed light coloured stripes at the rear near its tail when I realised that what I had seen was not anything I had seen before, like half dog, half wallaby but not a dingo. I kept away from the area for a few minutes to think about what had happened and decided to go look for it to check on what I had seen as i had never before heard of thylacine sightings this far north. As i searched for it, I noticed I could still hear slight movements in thick lantana = infested bush, where there were big logs laying, a perfect hiding place. At this point I decided to let it be and I went to tell others what a strange thing I had seen in disbelief it was a thylacine. I researched on the computer all afternoon for a dog-like marsupial but could find no other explanation. My Girlfriend had seen this same animal running awkwardly down our road and into the bush 4 months prior. Smith Rating: 21. This report is assessed as fair under the Smith reporting system. My friend Tony Kitchener who was with me when we sighted these Tasmanian tigers died in 2010 so I have decided to report the sighting before i follow him. we were going trout fishing at Lake Peddar in south west Tasmania summer of 1989. we were going in to Scott’s Peak dam at the southern end of the lake. about 20 k's or so in on the dirt road there is a place where you go up a fairly steep hill and when you reach the top you can see the lake for the first time. Back about 100 metres there's a tight-ish left hand corner that's where we saw the tigers. they were crossing the road and then they went into the bush further up the hill. We first saw them at about 60 metres last saw them about 15 metres . sighting lasted about 7 to 10 seconds. one tiger stopped and looked at our car while the other crossed the road. he then turned and followed across the road and up the bank then we lost sight of them in the ferns and underbrush. they weren't frightened at all and didn't run away they ignored us really.it was about 2pm as we were going fish-caking that night and had to set up camp etc. Smith Rating: 43. This report is assessed as very good under the Smith reporting system. I was standing in my lounge and out the window I saw the tail end of what i thought was a stray dog striding down the centre of my court, so being an animal lover i naturally went to investigate. I saw the animal dart behind a van acros the road and into the yard across the street. When i came around the van i saw an unusual long legged short haired animal looking skinny and unwell with a long tail that was bent up slightly at the end and brushing the ground. The animal was panicked when it saw me and tried to jump the fence. I remember thinking it's not a dog, it was moving wrong and its legs were too long for a cat, and it wasn't a fox because it had dark ring makings on the tail and was a grey brown colour, gradually darkening towards the rump. I took some steps back so not to corner the animal, and it almost jumped along as it ran across two yards into a bush where it stopped and looked at me in the eyes. Its eyes had dark eye lining makings like a big cat, but i called it like a dog and said come here puppy, and at this point the gas meter man came around the corner and the animal moved across the road into a building site and through a fence. As it did this, i looked at the man and asked him if he had seen that- and he said "what was that? It wasnt a fox ... " I went to investigate and he went on with his job, saying he sees some weird things on his rounds and by this time the animal was gone. I spent the rest of the day with this animal popping into my head because i was worried for the animals health and wondered what the heck it was. As i described the event to my partner the first thing he said was thylacine. I have had Goosebumps since. Could it be possible? Bigger than a cat or a fox, longer tail than both almost like a greyhound tail, female kelpie size, long back legs, small cat like head, at the top with a foxor dog type muzzle. medium to dark brownish grey, with dark rings around its tail. Distance: (Report says 3) I've assumed that this is meant to be 300 metres - Warren. Size of animal: About the size of an english sheep dog. Duration of sighting: 3 mins. Smith Rating: 5. This report is assessed as questionable under the Smith reporting system. multiple people involved in sighting. No previous reports in the area. Witness does not claim this was a thylacine - 'Unsure'. Lengthy observation (3 minutes) and located next to a house - no other video evidence (say from a phone for example). Description of animal provides little further support to this being a thylacine sighting. Small cat like head doesnt seem to match thylacine head descriptions. We were travelling across tassie from the spirit it was very quiet being xmas eve we hardly saw another car we had past Campbell Town though I cannot say how many kms past it was dusk our headlights were on. it ran across the midland hwy in the beam of our headlights I said to my husband what was that? I knew it was not a cat or a dog, and too big for a fox. It was light brown in colour and had a straight long tail, but hard to distinguish the exact colour in the headlights. It lopped across the road and disappeared into the scrub. we had never seen anything like it before and it was not until we were at mt field info centre and saw a picture of a tassie tiger that we realised what we had seen. I now see that there have been other sightings in the same area. Behaviour observed: Just loped across the highway. Weather conditions: clear warm night. Smith Rating: 33. This report is assessed as good under the Smith reporting system. · This is the second similar sighting reported to TRU within this area. With the animals in question displaying similar behaviour. Name and Information supplied but the person wishes to remain anonymous. On my vacation to Tasmania i was heading south from Campbell town when I got lost (lucky me) when I saw these two creatures crossing the road. At first I thought it was stray dogs so I beeped my horn to try and get them out of the way. Then when the didn’t move I inspected them further (sorry about my English) I saw they had a black striped pattern that reminded me of a tiger. I beeped again and moved my car forward when they snarled and ran of the road. The distance was 5-10m. The animals were the size of a medium dog and had medium to large black stripe pattern pale fur (could have been yellow) they didn’t see me as a threat until I moved my car forward all they did was stare. The sighting was made by my brother and I and lasted for 6 minutes at dawn (4:00 AM) with the sun just coming up. Some footprints were observed in the dirt but were not collected. Smith Rating: 27. This report is assessed as good under the Smith reporting system. previous reports in the surrounding area. Note that sunrise for 3/3/2012 was at 0513.
the size of the animal is consistent with that of thyacine. 6 minutes is a lengthy sighting period. Sighting Report - 2009 - tullah, tasmania from Jan M.
I drove up the hill from my house with a 12 year old passenger and we saw the animal run very fast across the road. It was the size and shape of the tiger. My neighbour had made a sighting some years previous. We are on the edge of the temperate rain forest here. The animal was about 2 meters, very slim and sleek coat. long tail held straight out. On seeing the car the animal ran at a very fast pace across our headlights and into the scrub, the sighting lasted 5 seconds, it was a clear night and the animal was about 10 metres away. Smith Rating: 24. This report is assessed as fair under the Smith reporting system. previous reports in the area. description of the event including the habitat, actions of the animal in question and time of day. 5 seconds is a reasonable time for a sighting. I had lived in Melbourne for most of my life; I had married a dairy farmer in 1974. 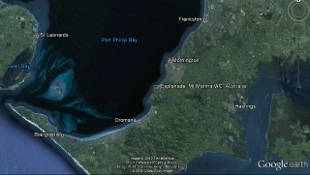 I lived in Preolenna on the North West Coast of Tasmania, 27km from nearest town Wynyard. I was coming home from visiting a friend at Meunna to Preolenna at 3pm. The rain had stopped as I travelled along Meunna road. It was a narrow road with bush on either side. An animal came out of the bush on my right hand side. I knew it wasn't a dog, firstly because it lopped across in front of me instead of how a dog runs. Its tail wasn't bent it was straight' It had very distinctive stripes across it's back and looked to me like a young dingo type dog. It wasn't afraid of the car it just looked ahead to the other side of the road where it was heading. I thought to myself "that must be the animal that was eating my friends hens. (I found out later that that was the Tiger Cat). All my growing up years in Melbourne I had never heard of the Tasmanian tiger. That night when my husband came in from the dairy, I just mentioned that I had seen the animal that ate the chickens. In our conversation my husband realized that I had seen a Tasmanian tiger. I rang the Ranger in Smithton and told him what I had seen, He confirmed what I had seen and told me not to mention it as there had been many sightings and they were on the move. He wanted to protect them. I did mention it to a farmer in Meunna and he said that a lady from Preolenna had also seen one ten years prior in the same spot. I know what I saw so very clearly. It was a lovely young animal. So no one could ever tell me that they don't exist.. If I had have known at the time that it was the Tasmanian Tiger I could have easily protected it's foot prints, however when I related the animal to R. it was four hours later and we had heaps more rain. The size of the Tiger was that of dingo, however it looked a young animal. Same shaped face side on as a dingo. The Tiger didn't look directly at the car just straight ahead the noise of the car didn't bother it at all. The Tiger was brown fairly light brown face and it had distinct dark stripes through its body. The animal was a little over a metre away for 7 to 10 seconds before the tiger crossed the road into the bush. I was surprised that the Tiger didn't appear to be a shy or a frightened animal considering that it was so close to a moving car. Driving home at 7pm along the esplanade in Mt Martha, no other cars around at the time, there in front of me about 15 meters away I saw this animal crossing the road, reasonably quickly and apparently unaffected by the headlights of my oncoming car. The animal kept its pace and then disappeared into the shrubs. The animal was about the size of a medium dog, with a long stiff tail that extended horizontal to the road, with an ungainly face paced walk, a Longish snub snout. The Coloration was light greyish fawn with some stripes on the hind quarters and was moving at a fast paced walk. It was a clear still night of mild temperature and the sighting continued for approximately 10 seconds before the animal disappeared into the surrounding shrubs. Hey there, me, my dad and mum, were at my mates place in Maribyrnong, Victoria. My mum was on balcony of my mates flat, when my mum started screaming "looks theres a Tasmanian tiger! ", i was inside watching TV and i said "mum your going crazy," but she kept on screaming. So me and my dad got up went out onto the balcony and looked down onto the vacant block of land to see nothing. So i said to mum "its probably a dog", ill go take a look, so i put my shoes on and mums saying "dont get too close to it it might bite ya" i kept laughing at her, at this stage i wasn't expecting to see anything, so i didn't take a camera, so I went towards the vacant block then suddenly this animal comes out from the fence, and i was about 10 - 15 metres from it, and i can tell you it looked 100% like a Tasmanian tiger, it was different and wasnt a dog or a fox. its tail was long and stiff it ran different to a dog, and it even had stripes on its back. I swear on my mothers grave it was a tassie tiger , or a dog that looks 100% like a Tasmanian tiger, i was the closest to it, and it looked exactly like in the pictures. So i ran back up got a camera but when i had came back it had gone, i ran around into the scrub land for a hour, across the road from the apartment hoping to find it, but it had gone. It wasn't overly orange had a few shades of gray from memory, but what was different from a dog was its head, its tail which was stiff straight, and its tiger markers on its bum, it looked exactly like a tasmian tiger, as i was only 10 metres away from it. it also had scrawny back legs/hips. Your probably thinking this could be anything its in a outer suburb of Melbourne, why haven't other people reported anything, i dont know. I think the location is irrelevant, what is relevant is i know what i saw, and yes my mum wasn't crazy , i can back her up. I wouldn't be on this website if i had a slight doubt that it was a mangy dog or fox. I saw what i saw and yes i strongly believe it was a tassie tiger. Report a sighting Web form from Alex D.
I asked him what the problem was, and he said there were some "special animals" that he thought might take the bait. "What, like quolls?" I asked, and he became a little furtive and said "Sort of." I began explaining about 1080 being the best fox bait because most native animals had some resistance to it, as it occurred naturally in the environment in the vegetation, and explained that when it was buried and widely spaced, the chances of quolls getting a lethal dose were much reduced. He said "It's not just quolls." I asked him what other animals he was concerned about and he went a bit quiet for a while, looking at the bottle of Cascade light in his hand. Finally he seemed to come to a decision and said: "I guess it doesn't matter so much now, 'cause I don't own the property anymore." and he put his finger on the picture of the thylacine. "This picture doesn't show their legs- they are way more muscular than this". He proceeded to tell me about how he and his wife owned a property at the edge of a deep gorge in the Torrington area where they had a deer farm. They went spotlighting one night and saw Three thylacines- two adults and a juvenile, they followed them for a while, the juvenile mostly hidden by long grass, but the large adult jumped onto a rock to look at them, and from an estimated 10 metres stood in the full beam of the spotlight, looked at them and yawned. "Its bottom jaw was on its chest." the guy told me "and they have such weird arses." (he mentioned their weird arses a few times). The other adult and the juvenile went off into the gully while the big one just stared at them for "half a minute" before bounding off and following them into the gully. The property was called "Whynot" near Silent Grove and the sighting was about two and a half years before he was talking to me- about 2005. "There could be anything in that gully." he said. I have heard other stories from the eastern side of the great divide in northern NSW from old timers, (usually second hand), and a first hand story from the snowy mountains in NSW where a Thylacine was seen eating a rabbit on the side of the road in about 1985, and another story from the early sixties near Byron Bay- two blokes travelling together came to Kakadu and told me about a woman in Byron who had been hounded out of town for claiming to have seen a Thylacine, (including by the storytellers) but then they saw it too, and felt really bad. They also didn't tell any locals because they didn't want to be tarred with the same brush. They are on the mainland and they are as real as you and me mate. At least in 1978 when I saw one on the long plain road in the mountains near Canberra. I was on foot. It was early morning. In 1980 whilst hiking in the Coolomon plain area, I entered a narrow section of open plain near the Coinbill turnoff on the Long Plain Road. The time was approximately 6.15 - 6.30 am and the sun had been up for about 30 minutes. My attention was caught by the movement of something about 60 meters away that at first glance I thought was a medium sized feral dog standing head down in short grass roughly 15 meters from the eucalypt scrub that borders the paddock like plains of the area. The animal was a tan-caramel colour with pronounced dark stripes from shoulders to rump and had a ridged "kangaroo like" tail. Quite suddenly the animal reared on its hind legs, nose to the air, turned to the opposite direction than that it had been standing and raced into the vegetation at speed. The animal moved in a way that I had never encountered before. It appeared to bound away using its front and hind legs in unison reminding me of a wild boar in full flight but with much smoother and longer strides. It was obvious that the animal had seen/smelt/heard or sensed my presence and simply vanished. The encounter lasted in full no more than 15 seconds. I walked to the spot where the animal had been and found a small dead wombat "gutted", a very strange sight for the plains. This was apparently the meal of the animal I had just seen. · How could I have seen an animal presumed extinct in Tasmania for the past 70 years? · How could I have seen an animal presumed extinct from the mainland for 8000 years? · If so, How could they have remained undetected this length of time? 1840 the Van Diemen’s Land Company offered a bounty on the Thylacine. The Tasmanian government followed suit in 1888. Records show that bounties on 2,268 Thylacines were collected between the years of 1888 and 1914. 1933, the last captured Thylacine was placed in the Hobart zoo dying later the same year. 1936, the government totally reversed its stance and granted the Thylacine complete protection, imposing severe fines on anyone killing one. The Thylacine from all accounts is an extremely shy animal, avoiding all contact with humans and lying low and remaining out of sight during the daylight hours, becoming active hunters at night. It is believed that family groups could contain up to six members and the mating season from accounts was from September to October with 3 or four young being born in November or December. The Melbourne Zoo recorded the birth of four pups in captivity on the mainland, (contrary to most reports that no Thylacines were ever bred in captivity). A marsupial carnivore would seek a preferred habitat. A combination of dry eucalypt forest, wetlands and grasslands perfect habitats provided in the Australian Alps. (see map below). The area of the Australian Alps and Great Diving Ranges of Victoria, New South Wales and Queensland supply extensive areas of habitation where a shy, nocturnal animal could easily exist un-hampered and undetected. There are still many thousands of square kilometres of bush land that have had no more exploration than an aerial survey. This animal is hardy and adaptable; it can withstand winter snow and frosts, summer extremes of more than 30 deg C. The Thylacine was exported to Zoos in Great Britain, Europe and The United States a wide range of environmental conditions in rainfall, temperature. In the last half century, sightings have been reported from many parts of the country, with most from the well- watered, mountains in the East and South-East of the continent with over 500 recorded sightings. 1957 in a Rural New South Wales in a small aboriginal community west of Sydney. A young boy grew up in a small community with intense interest in his natural environment and familiar with the local animal species due to spending all of his time in the bush. In 1971 at the age of 18 the young man's car and the family car were packed up to take the 9 hour drive in order to move locations so the young man could attend university. The two cars were travelling in convoy with several hundred metres separating them due to dust. The second car (the parents could not see the young man car that was in front). An animal trotted off to the side of the road as he drove past. At first it struck him as been a big dog but it had obvious dark stripes going across its back and tail. The young man was familiar enough with the bush to know that it was not a shadow pattern he knew what this out of place and foreign and abnormal animal species. The animal was no more than 10m from the front of the vehicle. The young man did not stop but was travelling slowly at the time due to the nature of the dirt road he was travelling on. He continued on to the next closest town as he was unfamiliar with the way next to travel and to wait for his parents. When they turned up he approached them and asked "if they saw the dog back there with stripes on its back?" And they replied "No we didn't see anything!" The young man remember thinking “my god then I don’t know what that is then!”. This was the extent of the sighting at the time. The sighting was then forgotten as the young man studied gained his degree. Years later he saw a picture in the dentist of a Thylacine which triggered the memory of the sighting and instilled in the young man that was what he saw. But knowing that thylacine were meant to be extinct he was worried that he may have been loosing his mind. He kept his sighting secret for over 40 years at risk of been ridiculed due to his profession. Years later he was married and years after that the man told his wife of what he saw and she encouraged him to share the sighting, talk to someone and not take the sighting to the grave. The man approached some people at the university but to no avail. The man kept his secret for 40 years before directly contacting T.R.U. after researching it on the web and contacting us directly through the contact us web form and wanting T.R.U. 's Chris Coupland to call him directly on the telephone. The call was anonymous but Chris was given enough information to be reassured that the sighting was legitimate and credible.